While operating any machine, it is necessary for us to take a lot of care. Our present article on, 10 Safety Precautions to Take When Using A Drill Press is one such compilation of the rules that we must follow while using a Drill Press. Kindly go through each of them and enjoy working with the Drill Press without any kind of trouble. 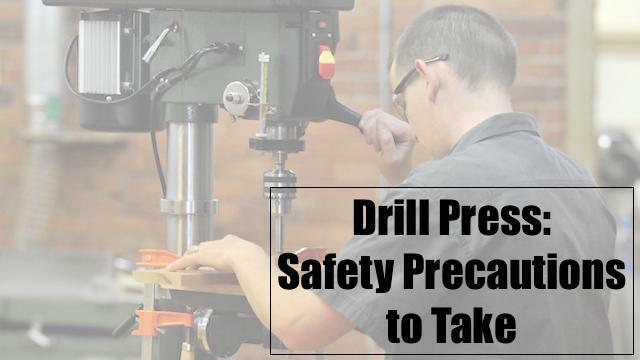 Here is a list of Safety Precautions to Take When Using a Drill Press. All these safety tips are necessary for better kind of working and avoiding any kind of accidents and injuries while working with the Drill Press. Our body is exposed to pretty much danger materials while carrying out the Drilling Operation. Therefore, it becomes essential for the users to wear the proper kind of protection while working on the drill press. Wearing an Apron will protect us from the flying scrap. Whereas, wearing safety goggles and a face shield is also necessary for avoiding any kind of wound or injuries to the operator. Although working with the Drill Press is very much easier. But, the drill machine is very much heavy in its construction. Due to this, it is necessary for us to take a lot of care while operating it. First of all, before you begin with the Drilling Operation, you must clear the drilling space. There are plenty of unwanted materials lying over there. Such as scrap, small cuttings tools, clamps and a lot more. Hence, before starting the machine you must clear all such unnecessary materials from the work table. In this way, you will be easily able to work with the drill machine without any kind of worries. This will also reduce the efforts that we have to make while working with the Drill Press. Fingers are more exposed to injuries while you are working with the Drill Press. Thus, you must keep your fingers away from such harmful elements. These harmful elements include the cutting tool as well as the scrap that is released from the workpiece after the cutting procedure. Perhaps, this is among the important Safety Precautions to Take When Using A Drill Press. Wearing loose clothes while drilling can cause them stocking up in the rotating tool. This can give your whole body a jerk and might result in a severe accident. Due to this, you must take care of your clothes and wear them in a proper manner while working with the Drill Press. It is necessary for us to secure the cutting tool in a proper position. If not secured properly, it might come down while the cutting is ongoing. This can cause the workpiece to rotate along with the tool. If the human body comes into contact with this workpiece, this might result in a horrible accident. Therefore, fitting it tightly in the place is utmost necessary. We must not apply unnecessary force on the Drill Press. Otherwise, it might affect its cutting operation. Overloading the drill press with more amount of force of your hands can cause a lot of trouble and result in a rough profile. Hence, the operator must gently press the drill in order to create a smooth kind of profile. Apart from that, we must also take a proper care to not to imbalance the drill press. While working with the Drill Press, it is necessary for us to avoid touching some of its components. These components include the cutting tool that is going through the rotation. If we come into contact with such tool, it can cause severe deep injuries to us that will give us a lot of pain. Next thing that we must avoid touching is the scrap. The fresh cut scrap is having a high temperature. If we touch it, it might give us a serious kind of burns. Due to this, we must take care that our hand doesn’t come into contact with this scrap. The speed limits for various kind of workpiece materials are already given on the table on the Drill Press. Hence, the operator must stick to the speed limits and shouldn’t try to overrule them. As per the design considerations, working at a higher speed can cause the overrun of the drill. Whereas, working at the lower speed can cause rough cutting profile. The environment in which the Drill Press is situated must have proper working conditions. We must avoid using the Drill Press, where there is moisture and the climate is hot and humid. This might result in the corrosion of the machine parts. Once you are done with the drilling operation on the drill press, we must clean the work table of the press. First of all, we have to unplug the machine and disconnect it from the power source. Afterwards, remove the cutting tool. Avoid touching it as it might be hot. Then, keep all the things in their proper place. 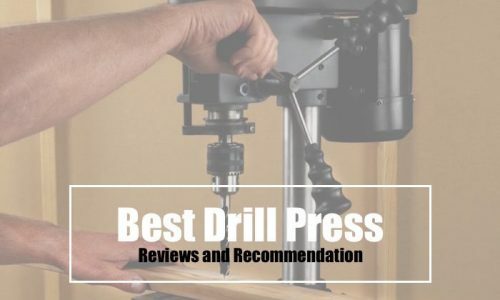 With this comprehensive article on, 10 Safety Precautions to Take When Using A Drill Press we have given an overview of the must follow tips. Following all the above-given tips, we will be easily able to avoid any kind of injuries or possibilities of accidents. Hence, we must have to be careful while going through them and following them for our own betterment. We hope our article will be helpful to you for determining the Safety Precautions to Take When Using A Drill Press. You can find many such interesting tips on our website.